Pedro Ramirez - Legal Assistant - Moran Law Firm - Fresno Ca. Pedro was raised in Fresno, CA after moving from Southern California. He knew at a young age that he wanted to work in the legal field. He graduated from Duncan Polytechnical High School. While he was there, he followed the Business career pathway that concluded with a course in Legal Occupations. That was where he got his first hands-on experience in a local law firm as an intern. He graduated from Fresno State with a Bachelor’s Degree in Philosophy with an option in Pre-Law. Prior to graduation, in 2015, a pre-requisite was to intern at a law office. He turned that internship into an employment opportunity for this firm and has been with us since. 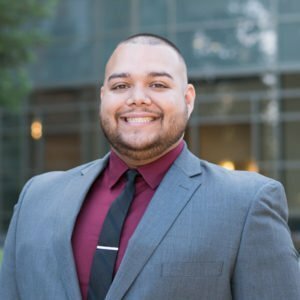 Currently, he is enrolled at Fresno City Community College taking Paralegal courses with the hopes of receiving an Associate’s Degree and Certification. At our firm, he works side by side with the attorneys and predominately handles communications and book-keeping.